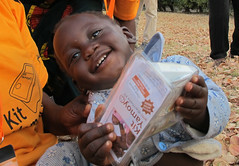 This blog post is prompted by a review of our work that mis-understood how and why we used vouchers in the ColaLife Operational Trial in Zambia (COTZ). If you assess COTZ retrospectively, as a trial of vouchers, it comes off very very badly! We did not set out to test the effect of vouchers on customer uptake; we used them in both of our intervention districts. The counterfactual in COTZ had nothing to do with vouchers: we were comparing a scenario with free ORS and Zinc in health centres (the status quo) with availability through the private sector (the intervention). And what did we find? 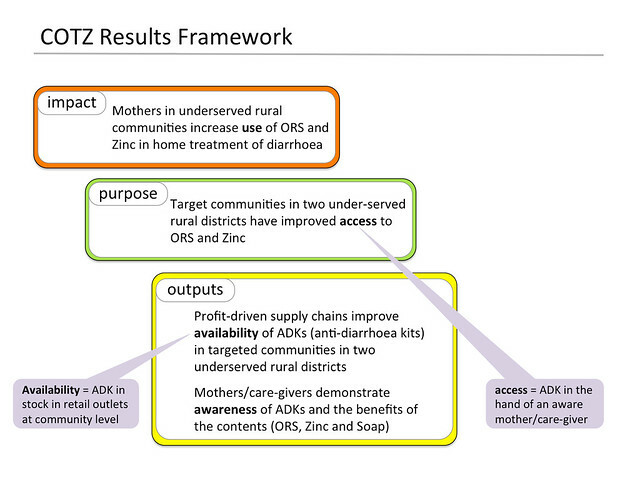 Use of ORS and Zinc in the home treatment of diarrhoea went up from <1% to 45% of children receiving the treatment when the treatment was available in village shops. So, if we were not testing vouchers, why use them? 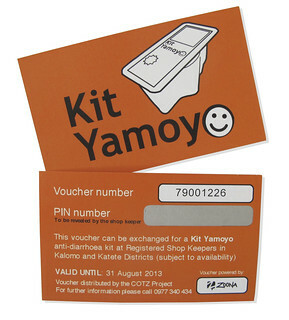 We used vouchers as one device to create a demand for the Kit Yamoyo in remote rural trial areas. 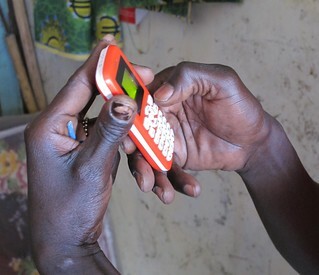 Other devices were: community-based education and marketing; and human centred design to create a product that our target group would want; the para-skilling of retailers; and training of health staff in the public sector. We wanted to test whether the existing channels that get Fast Moving Consumer Goods (FMCGs) to remote rural areas could be harnessed to get a health product there too. And then we measured whether any increase in availability (kits on shelves in rural shops) resulted in increased access and use of ORS and Zinc in the home treatment of diarrhoea. This logic is laid out in the COTZ Results Framework which was the foundation of the COTZ design. See below or on Flickr. * ADK = Anti-diarrhoea Kit. This framework was designed before the COTZ trial started and the Kit Yamoyo product had not been designed or named at this point. If we’d had 2 or 3 years to introduce a new anti-diarrhoea kit and create a market for it then we wouldn’t have needed vouchers. However, we only had 1 year to do this AND measure impact. Donors would not have agreed to a 2-3 year trial and anyway we needed to test the idea as quickly as we could, and allow the opportunity to ‘fail fast’ and move on. But we didn’t fail, as it happens. 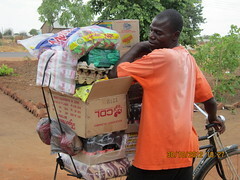 COTZ proved that you can get a diarrhoea treatment kit to remote rural areas in Zambia by creating and sustaining demand for it and making it profitable for retailers serving these communities to fulfil this demand. So the remaining question for the scale-up is “What’s the most cost-effective way to create and sustain this demand?”. In the trial we used vouchers but community-based marketing and/or para-skilling may be enough. Or mass marketing (TV, Radio, bill board advertising) by itself might be all that’s required. Our scale-up plan (KYTS – Kit Yamoyo Transition to Scale) would use all these approaches and measure their effectiveness. A key point is that we did not set out to test a voucher system in COTZ. That would have been another trial entirely. And if we’d been seeking to do this, we wouldn’t have confounded a test of vouchers with the development of a new product and its value chain which was the focus of COTZ.